The Otways and Shipwreck Coast is known for its natural beauty and attracts millions of visitors each year, particularly along the Great Ocean Road. The value of the region’s rich biodiversity is recognised at the national and global level and its wildlife is markedly different to other regions, including eastern Victoria which supports similar vegetation types. 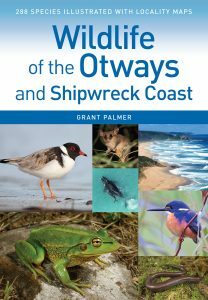 Wildlife of the Otways and Shipwreck Coast is a photographic field guide to the vertebrate wildlife of Victoria’s south-west. It covers all the mammals, birds, reptiles and frogs that occur in the region, including on land and in coastal waters. Each of the 288 species profiles includes a description and information on identification, range, conservation status, habitat use and ecology and is complemented by an exquisite colour photograph and a detailed distribution map. The book also includes chapters on habitat types, conservation and management, and on 14 key places in the region to view wildlife. This book will allow those interested in wildlife, including residents and visitors, to identify vertebrate animals found in the region. Readers will also become more familiar with the distinct role the Otways has in conserving Australia’s biodiversity.